Is Will Smith Concerned That ‘Aladdin’ Might Ruin His Career? One has never known what Will Smith under pressure might resemble. The closest we got to that is when he bungee jumped out of a helicopter while flying over the Grand Canyon. Fans had the pleasure of watching the death-defying stunt on his YouTube channel. Now, the Fresh Prince might be worried about the death of his career. In July 2017, news of Smith playing the omnipotent big blue guy who grants wishes got confirmed. It was either going to be Gabriel Iglesias or Smith getting the role, but the latter won it. Disney doesn’t have much history in adding someone with a “hip-hop” flavor to their characters, so some fans loved the idea. Fast forward to the trailer of the classic movie in 2018, and many have changed their tunes. People on Twitter found this rendition of Smith as horrifying. 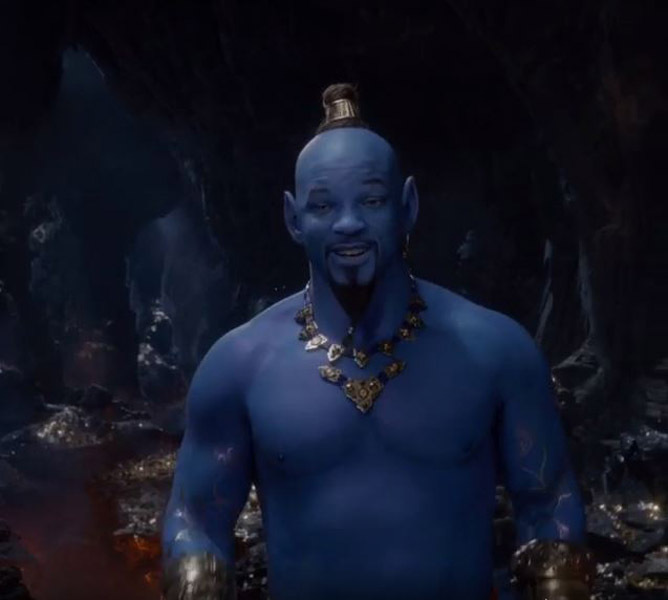 Jenny Nicholson tweeted, “Will Smith playing genie is what appears in my room when I have sleep paralysis.” The Young Folks tweet was straight to the point, saying, “Oh god, Will Smith looks terrible as a CGI Genie. #Aladdin”. Now we aren’t sure if this is everyone just following the hype train or if that many people are distraught by the appearance of a blue Smith. It seems like the kid from Philly is in his head too much. After the full trailer launched, People Magazine went and published an article noting that “Aladdin Fans Change Their Minds.” The initial backlash stemmed from critics and people only seeing a snippet of Smith Blue. We guess the world will have to wait until the official release date to determine if it was worth the initial backlash!